In Amanda Hesser’s lovely book Cooking for Mr. Latte, she shares an appealing recipe for chocolate cake that she calls Dump Cake. Okay, maybe the name isn’t so appealing, but after years of making cakes that involve folding two-thirds of this into one-eighth of that and timing the mixer for one minute and fourteen seconds, I was taken with the idea of making a cake that simply requires dumping this into that and you’re done. I’ve started with her recipe, added some cocoa, and removed some egg and liquid. 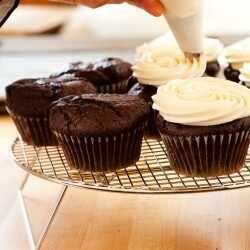 The result is a wonderfully chocolaty, moist cupcake that is one of the most popular items at the bakery. Do what we do to best enjoy the cupcake: Pop off the top half of the cupcake, put the bottom half on top of the frosted top, and voilà! You have a cupcake sandwich that gives you cupcake and frosting in each bite. The Crispy Magic Frosting forms a delicate sugary crust as it rests and it’s so easy, it’s magic! Position a rack in the center of the oven, and heat the oven to 350 degrees. Butter and flour a standard 12-cup muffin tin, or line with paper liners. In a small heatproof bowl, combine the chocolate and cocoa powder. In a small saucepan, heat the granulated sugar, butter, and water over medium-high heat, whisking occasionally, for 3 to 4 minutes, or until the butter is melted and the sugar is dissolved. Pour the hot butter-sugar mixture over tPosition a rack in the center of the oven, and heat the oven to 350 degrees. Butter and flour a standard 12-cup muffin tin, or line with paper liners. In a small heatproof bowl, combine the chocolate and cocoa powder. In a small saucepan, heat the granulated sugar, butter, and water over medium-high heat, whisking occasionally, for 3 to 4 minutes, or until the butter is melted and the sugar is dissolved. Pour the hot butter-sugar mixture over the chocolate-cocoa mixture and whisk until the chocolate is completely melted and the mixture is homogeneous. Whisk the milk, egg, egg yolk, and vanilla into the chocolate mixture until thoroughly combined. In a bowl, stir together the flour, baking powder, baking soda, and salt until well mixed. Dump the flour mixture on top of the chocolate mixture. Whisk until the dry ingredients are totally mixed into the chocolate mixture. Let the batter sit for at least 1 hour at room temperature, or transfer to an airtight container and store in the refrigerator for up to 3 days. (This allows the liquid to be totally absorbed into the batter, so the batter thickens up a bit and isn’t so soupy.) Spoon the batter into the prepared muffin cups, dividing it evenly and filling the cups to the rim. Bake for about 30 minutes, or until the tops spring back when pressed with a fingertip. Let cool completely in the pan on a wire rack. To make the frosting: While the cupcakes are cooling, in a small heatproof bowl, whisk together the granulated sugar and egg whites to make a thick slurry. Place the bowl over (not touching) simmering water in a saucepan and heat, whisking occasionally, for 3 to 5 minutes, or until the mixture is hot to the touch. It will thin out a bit as the sugar melts. Remove from the heat and scrape the mixture into the bowl of a stand mixer fitted with a whip attachment (or use a handheld mixer). Whip on medium-high speed for 6 to 8 minutes, or until the mixture becomes a light, white meringue and is cool to the touch. Turn down the speed to medium, add the butter, a few chunks at a time, and beat for 3 to 4 minutes, or until the butter is thoroughly incorporated. Add the confectioners’ sugar, salt, milk, and vanilla and continue to beat on medium speed until the mixture is smooth and satiny. You should have about 3 1/2 cups. (Use immediately, or transfer to an airtight container and store at room temperature for up to 3 days, then beat with the stand mixer fitted with the paddle attachment for a few minutes until smooth before using. Or, store in an airtight container in the refrigerator for up to 2 weeks, then bring to room temperature and paddle for a few minutes until smooth before using.) Remove the cupcakes from the muffin tin. Fit a pastry bag with a small round or star tip and fill the bag with the frosting, then pipe the frosting onto cupcakes. Or, spread the frosting on the cupcakes with an icing spatula. The cupcakes taste best on the day they are baked, but they can be stored in an airtight container at room temperature for up to 2 days. he chocolate-cocoa mixture and whisk until the chocolate is completely melted and the mixture is homogeneous. Whisk the milk, egg, egg yolk, and vanilla into the chocolate mixture until thoroughly combined. Spoon the batter into the prepared muffin cups, dividing it evenly and filling the cups to the rim. Bake for about 30 minutes, or until the tops spring back when pressed with a fingertip. Let cool completely in the pan on a wire rack. While the cupcakes are cooling, in a small heatproof bowl, whisk together the granulated sugar and egg whites to make a thick slurry. Place the bowl over (not touching) simmering water in a saucepan and heat, whisking occasionally, for 3 to 5 minutes, or until the mixture is hot to the touch. It will thin out a bit as the sugar melts. Remove the cupcakes from the muffin tin. Fit a pastry bag with a small round or star tip and fill the bag with the frosting, then pipe the frosting onto cupcakes. Or, spread the frosting on the cupcakes with an icing spatula. The cupcakes taste best on the day they are baked, but they can be stored in an airtight container at room temperature for up to 2 days. This entry was posted by AKat. Bookmark the permalink.